TIME TO RELOAD ON “CV WINE & SPIRITS” BEST-SELLING WHISKEYSINCE OPENING!!! We received our first bottle of UNCLE NEAREST during the holiday season last year and was told, “THIS IS ONE YOU HAVE TO TRY!” So, we did. And again. And again. Then, the bottle was gone (not all in one day). Not having seen this whiskey on the shelves at our regular spirit stock-up locations, we knew this would be an absolute MUST for our first email. • Nathan Green, AKA “Uncle Nearest” is the GODFATHER of Tennessee Whiskey and no one knows it? • Uncle Nearest was the first African-American master distiller on record in the United States? 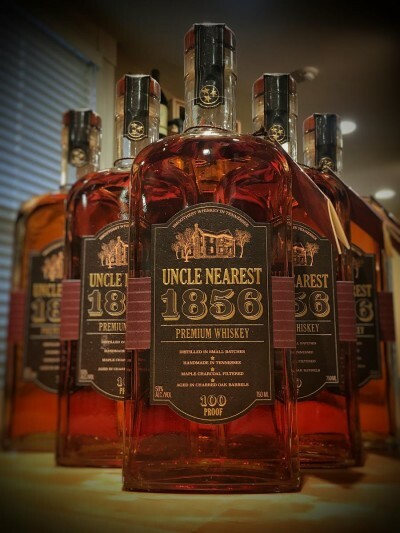 • Uncle Nearest was responsible for helping perfect the Lincoln County Process (use of sugar maple charcoal to filter new-make whiskey before aging)? • UNCLE NEAREST TAUGHT JACK DANIELS HOW TO MAKE WHISKEY? Well, it’s all true. At the end of the day though – its JUST DAMN GOOD WHISKEY! NOSE - Bale of hay, dried grass, stone fruit notes of ripe peach and apricot, caramel corn and sweet maple. PALATE - Spicy caramel up front with the proof, hints of maple then mellows with dried fruit and floral notes. Sweetness and spice reminiscent of freshly baked oatmeal raisin cookies. FINISH - Long and rich finish, lingers pleasantly sweet on the palate, notes of vanilla. BUT HAS IT WON ANY AWARDS? Here is an awesome PERK for all you CARPE VINO CLUB MEMBER…your wine purchasing discounts extend to spirits as well!!! Any bottle you purchase, take 10% off the retail price. Build a case (of 12+ bottles) receive a hefty 15% discount. BEST PART…you can mix/match with wine to build your case discounts. Purchase a case of wine, throw a bottle of SCOTCH (or any spirit you desire) on top and receive 15% off! Our prices?!? Let’s just say, the first weekend we were open a customer commented, “these prices are better than COSTCO” and that was before their discount!!! MUSIC TO OUR EARS!! !